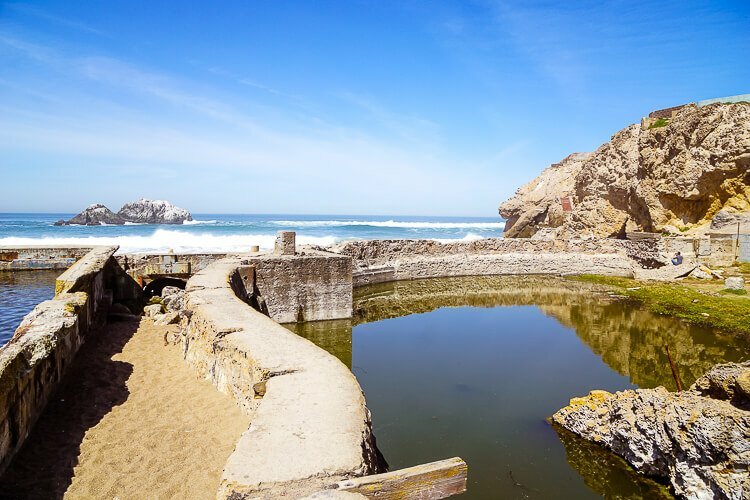 The Sutro Baths Ruins might just be the best-kept secret in San Francisco, California! If you’re planning a trip, make sure it’s on your itinerary! 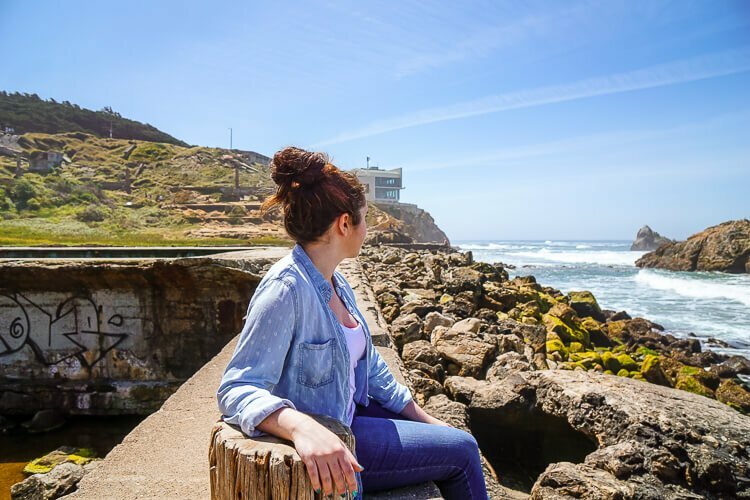 The Sutro Baths Ruins in San Francisco are a must-see when visiting California! As some of you may know, I recently got back from a cross-country trip. We took the train from Portland, Maine to San Francisco, California, I’ll be doing a full write up on the trip as a whole, but I’m so excited to talk about one of my favorite parts about the trip that I just couldn’t wait! Once we finally decided exactly where we’d be stopping on our trip, I reached out to my Facebook friends for their recommendations on things to do in the cities we were going to visit. 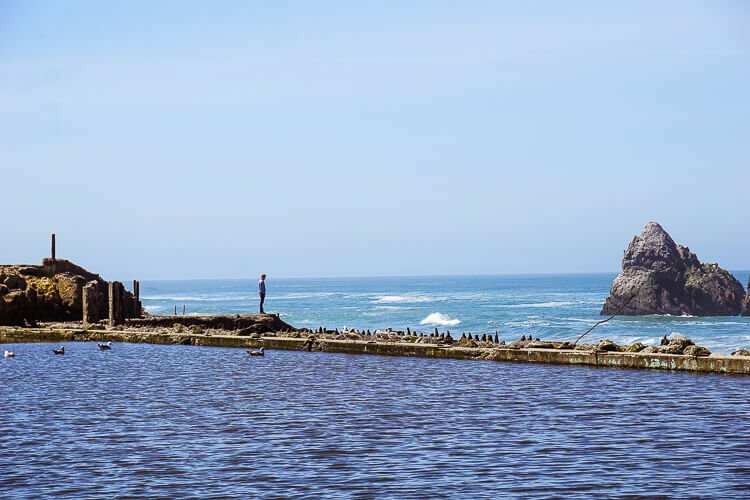 One of them recommended the Sutro Baths Ruins in San Francisco, not a place I had ever heard of and not one some of my friends from the area had even heard of. Which definitely made it an attractive stop on the list. 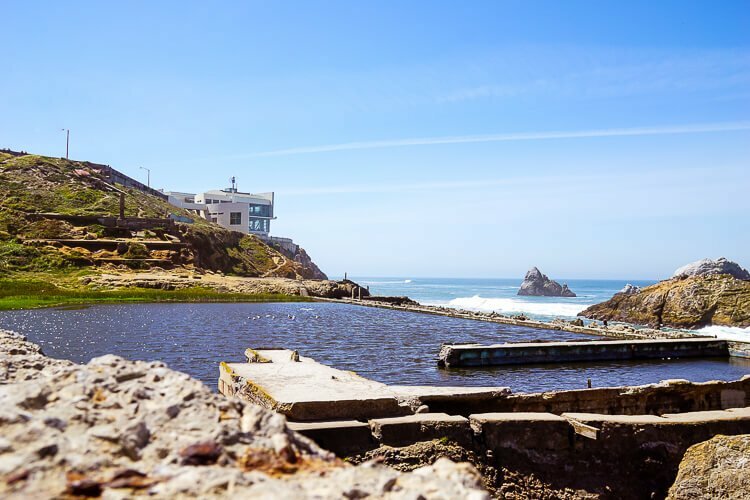 I love exploring places that many don’t even know about, and a place like the Sutro Baths is rather interesting because it’s right in San Francisco, you don’t have to cross either of the bridges to get to it, it’s RIGHT THERE. What surprised me, even more, is that even though we travel bloggers and writers always like to find the unique places, this wasn’t listed in a single article I read about things to do in the city. Thank goodness for awesome friends, right? Okay, so you’re probably wondering why I’m so excited over these ruins, well, “ruins” isn’t exactly a term you’d associate with most of the United States because we’re relatively young so that alone makes them pretty intriguing. Plus, these are really cool. 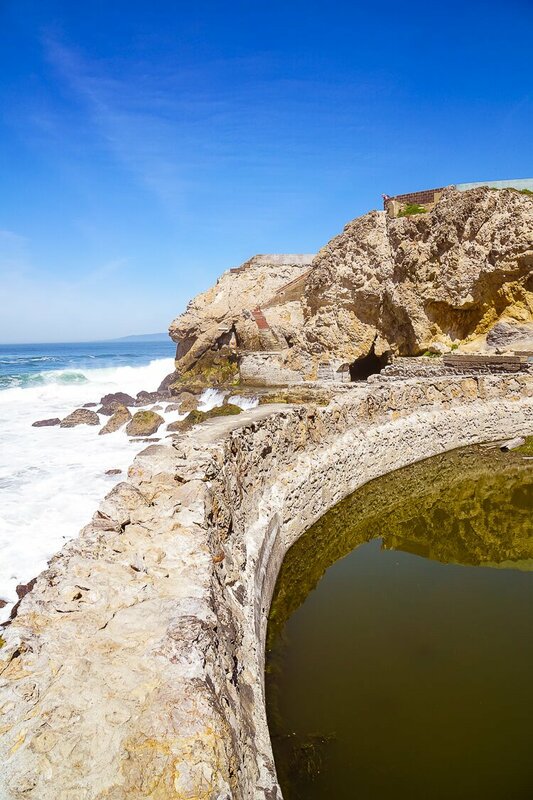 The Sutro Baths was constructed near the end of the 1800s and was a privately owned public saltwater bath. Imagine a large, enclosed pool fed by the Pacific and that’s what this place was. 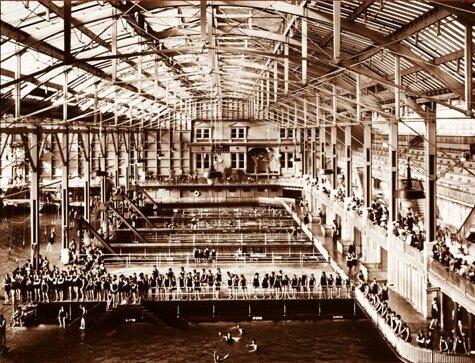 The Baths were developed by a self-made millionaire named Adolph Sutro, his hopes were to provide the city with an inexpensive source of fun and recreation. The photo above gives us an indoor look at the baths in 1900. There were seven swimming pools that were each kept at a different temperature. The pools required 1.7 million gallons of water, which could be provided by the Pacific Ocean at high tide in just one hour. The baths could accommodate up to 10,000 people at a time, which is a little nuts if you ask me! But the baths were more than just baths. The entrance contained natural history exhibits from all over the world; the building also hosted concerts and variety shows as well as some restaurants. Heck, it sounds like a place I want to go and hang out today, I imagine it was quite the attraction way back then. Unfortunately, way back when was only a short time before The Great Depression hit and public health codes were put in place. Eventually, after attempts to revive the once grand attraction, the facility and land were purchased by developers in hopes of turning the area into high-rise apartments. But the developers didn’t get too far either when shortly after they began work on the property, a fire ripped through the structure and destroyed the baths. After the fire, a building wasn’t pursued, and the area was left in ruins, which is where it is today. 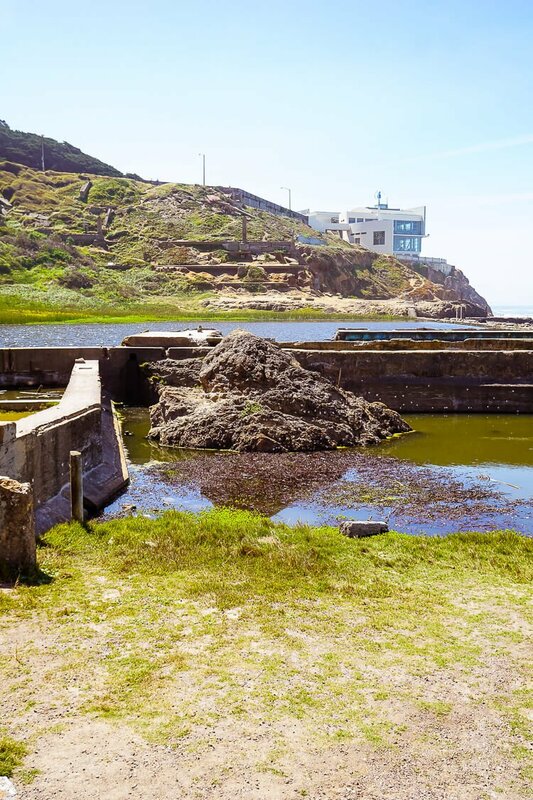 In 1973, the baths became part of the Golden Gate National Recreation Area and currently makes up one end of the Lands End with the Lands End Lookout up on the hill looking over the ruins. We took an Uber from our hotel in Union Square to the ruins; it was about a 25-minute drive since the Sutro Baths are on the outskirts, but that means there’s less tourists. When we got there, there were maybe a dozen people up in the lookout benches, but only a handful down by the ruins. Like I said, this place is a hidden gem even though it’s right out in the open. We grabbed an iced tea and some sunscreen and used the restrooms before heading down to explore the ruins. You can walk along much of the ruins, in fact, we saw a couple of families with small children there while we were exploring. The walls are about 2 feet thick, and as long as you watch your footing, you can walk right out to the edge like the guy below. The views of the Pacific are excellent. With the crashing waves and chatting birds, the noise of the big city is lost far behind you. There are tons of nooks and crannies to explore and even a couple caves you can go in, just don’t fall in the water because I think it would lead to a terrible, slimy green, day. From the ruins, we walked the Lands End Trail which gave us some spectacular views of the Golden Gate Bridge, and there are plenty of offshoots if you’re up for hiking. The Lands End Trail itself used to be where the railroad ran, so it’s pretty wide and except for some stairs, pretty flat too. We ended up walking from the Sutro Baths Ruins to Baker Beach; it was a great little hike! 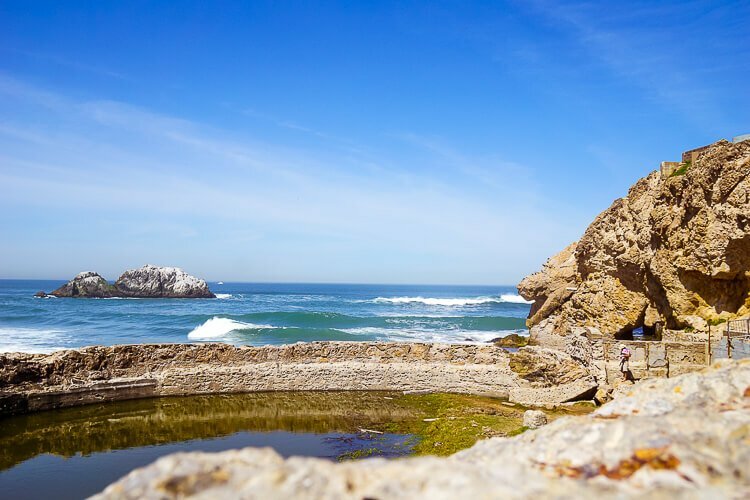 So the next time you’re in the Bay Area, make sure a stop at the Sutro Baths Ruins is on your agenda, it’s completely worth it, and it’s completely FREE! Plus, it won’t be anywhere near as crowded as the Pier and the views are a million times better! 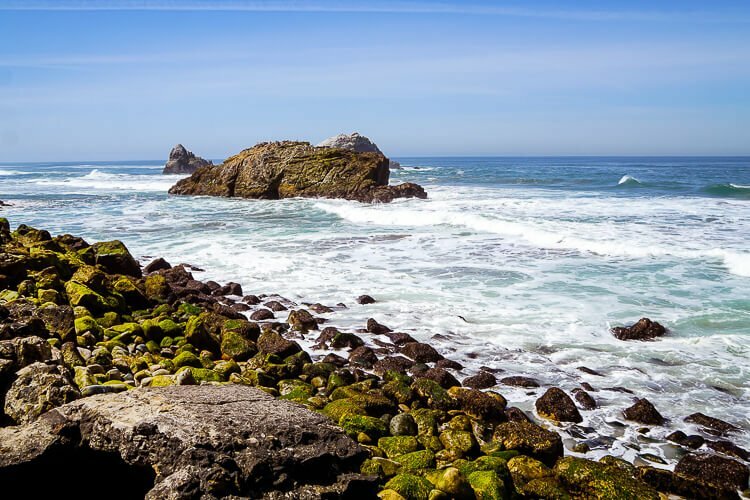 When Were the Sutro Baths Built? They were built between 1894 and 1896 and opened in March 1896. How Long Is The Land’s End Trail? 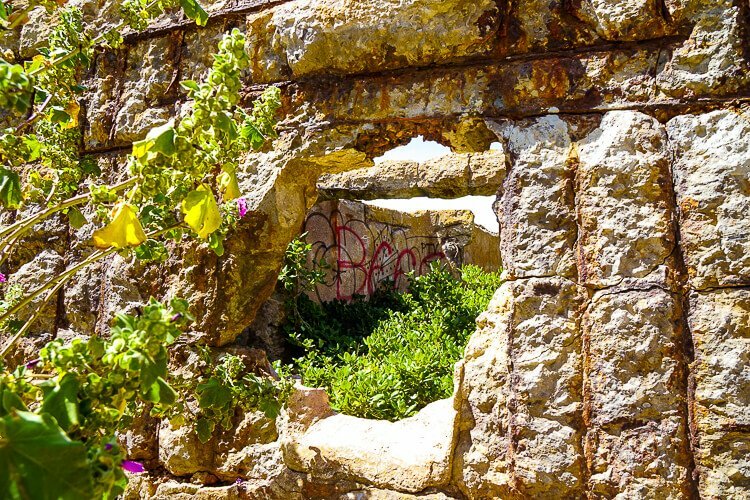 Can You Climb on the Sutro Baths Ruins? Yes, you can. The ruins are not maintained, so you may explore at your own will and risk. 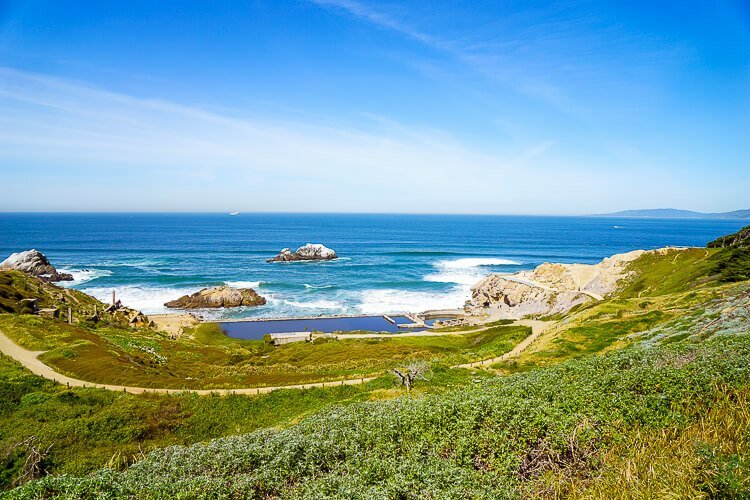 Where are the Sutro Baths? 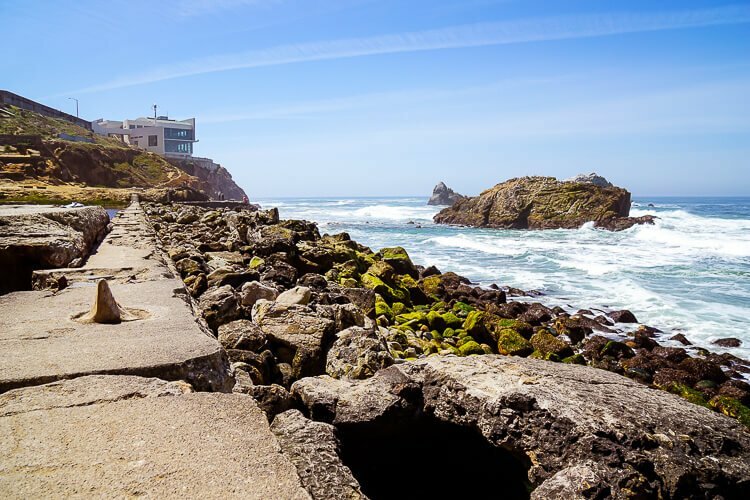 How Much do the Sutro Baths Cost? 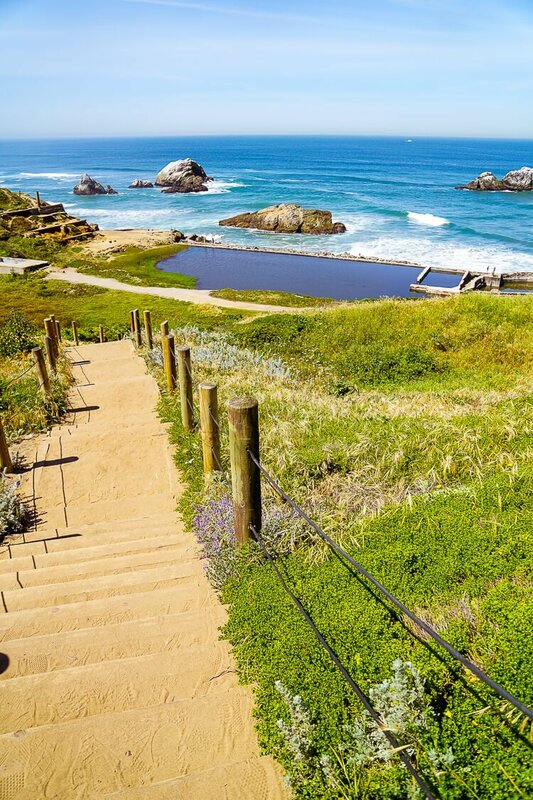 Pin the Sutro Baths to your Travel Board! Great little article, and so true! Sutro Baths was one of my unexpected favorites in SF. When I was a young boy, we used to go ice skating in an ice rink that was located in the Sutro Baths building. At one end of the rink was a large window that had been painted over. The paint had been scrapped off in areas and I would peek through to see the ruins of the pools beyond. I was intrigued! When you entered the building, you could go through the Natural History display which was a mess , very old and dusty. I don’t remember there being any visitors but myself. This was in 1961 before the buildings burnt down. I was 12 years old. 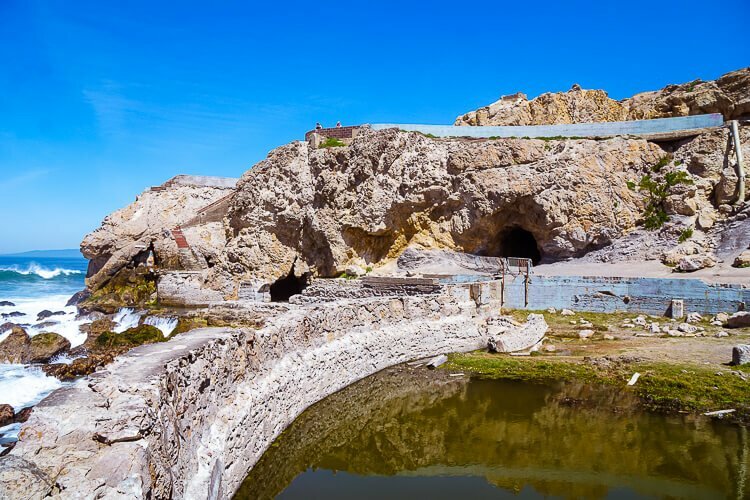 I just visited Sutro Baths on February 15, 2019 with my two daughters. It was raining and cold, but still fun. We just missed the Visitors’ Center as it closes at 5PM. It is quite a sight, even in the rain! I’m glad you had a good time even with the weather! 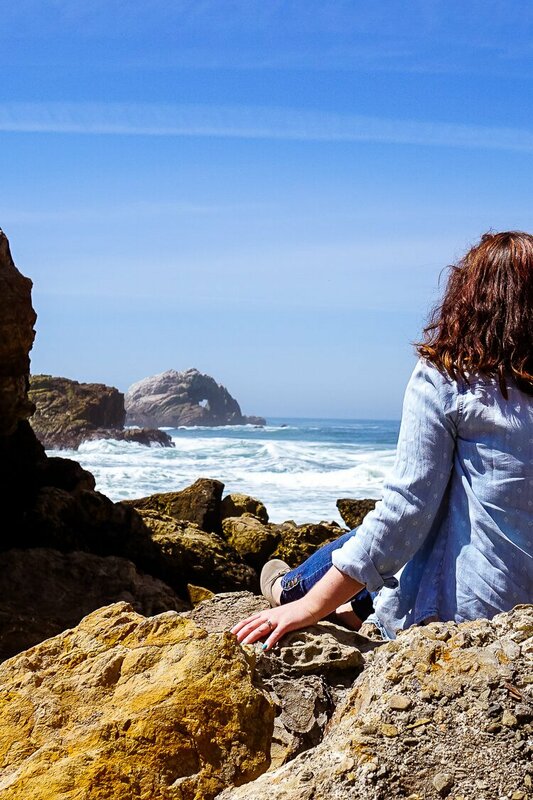 How long did the hike from Sutro Baths to Baker Beach take? I can’t remember exactly, but I want to say about an hour or so.